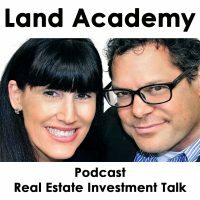 Steven Butala: Today, Jill and I talk about how Land Academy 1.0 is just about live. Jill DeWit: I can’t wait to share more of what it is. Steven Butala: Tell us, right now. Jill DeWit: No, not til the end of the show. Jill DeWit: They all fall off right about now? Steven Butala: Every single second that the show goes on, less and less and less. Yeah, we lost half of them already. Jill DeWit: Oh great. Thanks a lot. Well for those of you who managed to hang in there for another minute, we’ll get to it. Steven Butala: The first twenty seconds is our best but that’s about it. Jill DeWit: All right. Okay. Real quick. 1.0 is the updated version of our original program that we launched in 2015 and I’ll fill you in more in a few minutes, if you stay with us, all three of you. Steven Butala: There’s a couple questions in here. Number one, how long does it take and how much time do you spend? Steven Butala: Rolling. Exactly. As far as paperwork goes, Jill, why don’t you take a shot at that ’cause you hate the stuff I do. Jill DeWit: Well, again, it’s not that bad. I have a different way of explaining it and I agree with you. You have the engineering mindset the way you lay it out in a spreadsheet. I describe it like this. Say you only have four hours on a Sunday. One Sunday you spend picking the county. The next Sunday you spend downloading the data and scrubbing it to go out in the mail. The next Sunday you spend reviewing the offers and the calls and the things that came back. The next Sunday you buy them. Now is where there’s a little bit of tricky, yeah you got to plan out that week with the paperwork. I have to … what’s involved in this? I’ve got to make a deed of the person that I’m buying it from, this is just the paperwork part. Got to maybe go get a cashier’s check to pay for the property. I’ve got to call and arrange a notary. I have to send it to the notary. The notary’s going to send it back to me. Then I’ve got to mail it in to be recorded. That’s the process. It’s not that crazy. Can you do that a couple … if you put a half hour into it a day, every week, that week, Monday through Friday to get the whole thing done? Jill DeWit: Sure, and you’d be doing three deals at the same time by the way and it takes the same amount of time. The next weekend you’re posting the property for sale. The next weekend you’re marking it sold all over the planet. Then you’re doing it rinse and repeat. Steven Butala: It’s … I’m not trying to sell anything here, I’m telling you the truth. It’s way easier than you think. Jill DeWit: Just keeping the household running. Steven Butala: … I swear it takes about the same amount of time to do one or two real estate deals. Steven Butala: There’s a learning curve just like everything but check list it all out and here’s the beauty of it is, you’re going to learn the vast majority if not everything with the programs and with the stuff that we talk about on the show and all the resources they have. Dude you have an extra resource now with Land Investors. Jill DeWit: You have the people, the members. Steven Butala: Just ask people when you’re stuck. Number two, there’s YouTube. You don’t have to take our word for it, go on to YouTube and find out how to do a deed. There’s a ton of people doing all that stuff on there. Jill DeWit: Look on our channel. Look on all our stuff. Steven Butala: Chances are there’s probably people on YouTube that do it a little faster, they’ve got a better way. We just started recording deeds on the internet with online [crosstalk]. Jill DeWit: We did a little bit with Title Mind now we’re doing it again. Yeah. Steven Butala: We’re constantly improving, too. Steven Butala: You’ll get over it. Steven Butala: Today’s topic, 1.0. It’s just about live. This is the meat of the show. Jill DeWit: I’m sorry, I have a lot of hair today. You know. Steven Butala: Jill, you look great. Steven Butala: You always do. Jill DeWit: I feel like I look like Gilligan’s Island, Mary Ann. Steven Butala: Yeah. Or Daisy Duke or something. Jill DeWit: Okay, I’ll take that too. I’m not wearing the shorts. Steven Butala: That’d be cool though. Steven Butala: Yeah, you could pull that off easy. Jill DeWit: Thank you. That’s a different show Steven, there might be children listening. Steven Butala: They can’t see it. Their parents won’t let them watch anyway. Steven Butala: What do you think 1.0 is, Jill, in your own words? Jill DeWit: Land Academy 1.0 is called rural vacant land. It sounds a lot like the original program. You know why? It should. ‘Cause it’s not meant to replace it, it’s a refresh with the tools and the resources and the tweaks that we’ve learned in the last three and a half almost four years now. It’s an addendum if you will. Do you want to call it that? Or what do you want to call it? Steven Butala: It’s stand alone. If you … that’s all you watch, ’cause that’s how you learn but there’s a huge massive library behind it with the first program. The first program’s like 12 hours, this program’s maybe three. Steven Butala: It’s very condensed, step by step version ’cause we learned from our members since 2015. 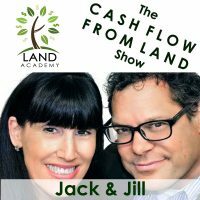 Jill DeWit: Well, some of the things I’m not doing in 1.0 that because it’s in Cash Flow from Land, everyone that joins Land Academy you get access to one … the first one, the second one and 2.0. Steven Butala: Yeah. Which is all of it. Jill DeWit: Exactly. In 1.0, I did not go into great detail about here’s what a deed looks like, here’s how you fill it out, here’s how you send it in to the recorder, here’s what a notary close is. This one I just touch on it and I say go back to Cash Flow from Land for the great detail part. I refer to that a lot. I’m not going to talk about calling the county and what that sounds like and those recorded calls ’cause they’re there for you in Cash Flow from Land. So, I refer to them there. But there are some new things like you just talked about. Gosh, for me due diligence. You want to touch on that? Steven Butala: Yeah. Due diligence is so much easier now because we launched a tool/website called ParcelFact.com. We’ve just made this so much easier over the last two or three years to get a deal done. The question in this episode is very appropriate. It was so much more complicated and difficult and lengthy to get a deal done in 2015 or even to decide if you want to do a deal. Jill DeWit: That’s good, right? Steven Butala: Resources we’ve made available are crazy awesome now. Jill DeWit: Right. Finding the property let alone the processing of it has changed so much. Steven Butala: It’s a lot less opportunity to make a mistake. Jill DeWit: Yeah. I can now pull a lien report because I have Title Pro 24/7. We didn’t have that in 2015. There were more calls and different things involved. Steven Butala: There’s never been a better time to actually … that’s not what I mean, it’s always a good time. What I mean is it’s never been easier. The learning curve has never been shorter and faster and less academically intensive than it is right now. We won’t stop. We won’t stop making it easier and easier and easier. Jill DeWit: I love it. We talk about this with the members that have been with us since the beginning. It’s funny ’cause we’re like, “Remember when we all had to sit there and try to figure out. We had a map over here and Google Earth Pro over here and we’re together trying to piece together, I think that’s the road to find the property.” That was hilarious. Jill DeWit: Then we evolved to at least one GPS coordinate. We got the center point, we thought that was the greatest thing on the planet. Now, with ParcelFact we have the whole thing? That’s a game changer. Jill DeWit: It’s so nice. Steven Butala: Well, you guys talk about ParcelFact. Jill DeWit: Exactly. I hope so. It’s funny I love seeing that we have a lot of … a lot of these tools, just so you know, you don’t have to be a member to access these tools. A lot of them you can buy ala carte and I was just going to say, I see a lot of people using our tools and resources ala carte for five bucks a day you can have ParcelFact. Go look up 100 properties, I don’t care, save them all up, get them on Sunday. Whatever you want. Look them all up, get your five dollars worth. Jill DeWit: It’s just so exciting. I’m glad that we did the 1.0. Steven Butala: The huge improvements, aside from the tools that are all. I talk about it and how to use all the tools. Steven Butala: The huge improvements for me or at the least the chapters I did are how to find a county is dramatically improved. How to increase your success on where you’re going to send mail. Number two, pricing is a lot more scientific and a lot less artistic. Steven Butala: Then, number three … this is about the same as the first one, I walk you straight through from start to finish a mailer in San Bernardino county, California and I get it in the mail using Offers2Owners. Jill DeWit: That’s another one we didn’t have. Steven Butala: Yeah, we never had a … Jill and I started a full blown bulk mail mail merge/commercial printer for our members to use and that’s … that was a huge bottleneck for a year and a half. People were saying, “I just can’t get past mail merge.” Well, now we do it for you. Steven Butala: I worked through all that. Jill DeWit: Isn’t that funny? That used to be a big hang up. Jill DeWit: That was a hang up, mail merge. Steven Butala: It was a hang up for me once I started. Jill DeWit: Mm-hmm (affirmative). I understand. Don’t think about it now. Jill DeWit: It’s not hard. You got this. Steven Butala: Whatever it is. It gets addressed now. Steven Butala: If we don’t directly address it in one of these programs, you just go on Land Investors and say, “I’m stuck here. Was anybody stuck here when you started out?” Just [pow] people just are all ready to help. Jill DeWit: Exactly. Hey, by the way, speaking of everything of that going on, our education stuff, I’m going to say it right now. For those of you who have been patiently waiting, enrollment has reopened as of today. Steven Butala: It is really? Jill DeWit: I was going to save it for the end, but then I’m not going to save it for the end ’cause by then, how many more people will drop off? Just kidding. Yep, just so you know, enrollment is reopened and there’s a special offer going on right now. Just so you know, when in days, not weeks, not months, when 1.0 is enabled on your member dashboard. It’ll just automatically be there, you’ll get an email knowing that it’s there. It’s coming soon. Steven Butala: … I know the editor and he said it’s going really well. Jill DeWit: Well, you know what happens? I’m going to be honest with her, here’s what’s going on, what and why we wanted to do this a week ago. Steven Butala: We always do. Jill DeWit: We always do, but you know what? We get into it and we realize you know what if we’re going to do it, we’re going to make it right, we’re going to make it good. Jill DeWit: If anybody’s to blame for anything being delayed or prolonged, not that everybody’s mad but it’s us. We make it right. Jill DeWit: That’s something about us. If you’re a member, you know that. You get in and see our stuff. We don’t hold back. We’re transparent. We’re going to put our heart and souls in it and make it good. Steven Butala: Our internal Land Academy mantra is constant improvement. We don’t talk about it ever but that’s just on the walls in our office. Steven Butala: Constant improvement get some. Jill DeWit: Get better, get more efficient. Steven Butala: Well, it comes down to yeah this is pretty good but it really could bring it home if we just wait one more week to add this or subtract this or make this more clear. Steven Butala: Last end editing process. Steven Butala: Well, you’ve done it again. You spent another 15 minutes or so listening to the Land Academy show. Join us next time where we discuss the three biggest challenges of our land careers. I can tell you almost for sure, that it comes three completely different things from me versus Jill. Jill DeWit: I know, it’s going to be fun ’cause this is one of those shows that we just … we don’t share until on the air so it’s going to be fun. Steven Butala: Yeah. Yeah we don’t rehearse it. Jill DeWit: Nope. [inaudible] at all. Steven Butala: Should be obvious by now. Jill DeWit: Yeah, in case you didn’t notice we don’t rehearse anything. We answer your questions posted on our online community LandInvestors.com. It’s free. Jill DeWit: Okay. It’s that obvious. Steven Butala: I don’t know. I don’t know. Jill DeWit: Oh, well, that’s … yeah. Steven Butala: You should do this, this and this. This is a lot of years ago. Jill DeWit: You don’t get those anymore? Steven Butala: Now, we get … you know what? What I get? Steven Butala: Thank you. Thank you. Thank you. Steven Butala: Seriously. Thank you for doing the show. I get a lot out of it. Jill DeWit: That’s true. That’s true. Steven Butala: It can make my commute easier. I get constantly I truly get emails like that. Jill DeWit: I know and I love it. Hey, wherever you’re watching or listening, please rate us and please comment. No, I’m serious, ’cause just like Steven said, we do read those and we love those and keep them coming. Thank you very much.